Judging by how urgently Goldman's research department is trying to get the bank's clients to sell treasuries, Goldman's prop traders must have a desperate bid for duration in anticipation of what probably will be a historic deflationary shock. It started a month ago when Goldman calculated that the US debt supply will more than double from $488bn to $1,030bn in 2018. Now, in yet another note meant to prompt selling of Treasurys (and buying of stocks that Goldman's co-head of equities admitted last week he is all too willing to sell), overnight Goldman's economist team wrote that "Federal fiscal policy is entering uncharted territory" after Congress "voted twice in the last two months to substantially expand the budget deficit despite an already elevated debt level and an economy that shows no need for additional fiscal stimulus." 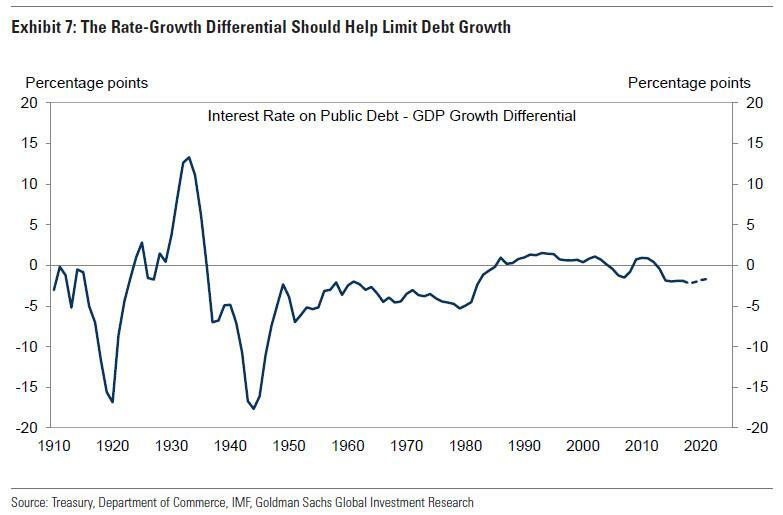 As a result of this historic expansion in U.S. borrowing during a period of economic growth, alongside rising bond yields, Goldman predicts a surge in the cost of servicing American debt, and goes so far as to warn that the current US fiscal trajectory would lead to catastrophe: "the continued growth of public debt raises eventual sustainability questions if left unchecked." What has so spooked Goldman, which rhetorically asks "what's wrong with Fiscal Policy?" is that "US fiscal policy is on an unusual course. 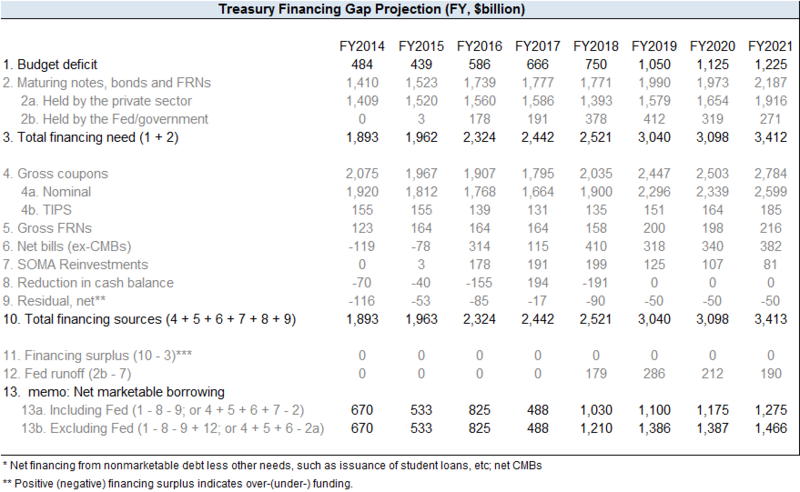 As shown in the left panel of Exhibit 1, we expect the budget deficit to widen over the next few years, as a result of prior imbalances and recently enacted policies, which should lead to a federal debt/GDP ratio of around 85% of GDP by 2021." "This stands in contrast to the typical relationship between the economic cycle and the budget balance, as shown in Exhibit 2. The result is a cyclically adjusted budget balance that we project to be wider over the next few years than at any time over the last 50 years with the exception of the 2009-2012 period following the financial crisis. In our view, this gap is driven by a combination of longer-term factors described below as well as the recently enacted tax cuts and spending increases. 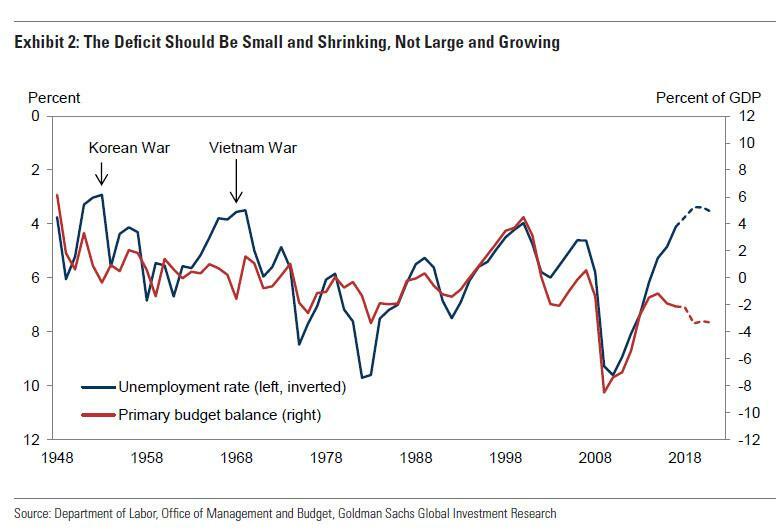 For the non-fiscal conservatives, Goldman conveniently highlight the following: the US deficit should be small and shrinking, not large and growing. The reason for this is that while revenues look likely to remain at the lower end of their historical range (over the last 50 years, revenues have fluctuated between around 15% and 20% of GDP, averaging about 17.5%), mandatory spending continues to grow. 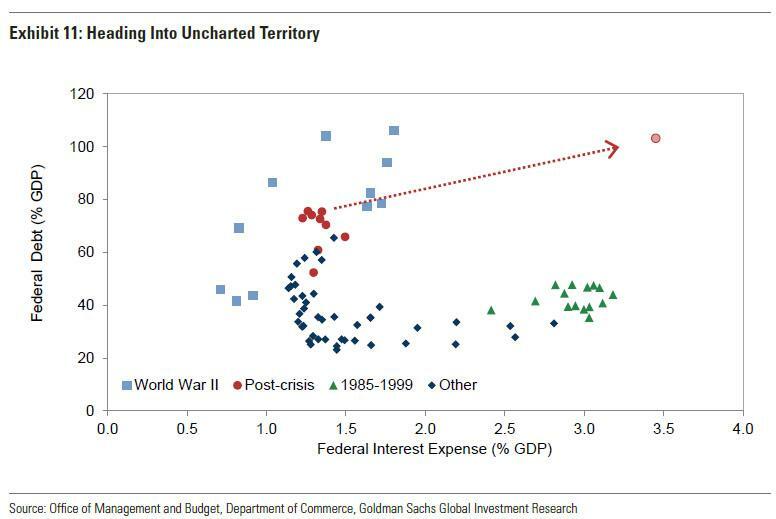 According to Goldman, and as shown in Exhibit 3, federal primary spending is at the higher end of the historical range, but looks likely to continue to increase as a share of GDP absent further policy changes. Projected increases in mandatory spending—this includes Social Security, Medicare, Medicaid, and income support programs—are primarily responsible for this rise. Additionally, "health spending has continued to rise. While health care price inflation has remained subdued for several years, enrollment in federally subsidized health benefits has increased and recently released estimates by the Centers for Medicare & Medicaid Services Actuary anticipate an increase in spending growth in 2018-2020 due to an expected increase in the volume of care and an uptick in healthcare inflation." We expect rising interest rates and a rising debt level to lead to a meaningful increase in interest expense. On our current projections, federal interest expense will rise to 2.3% of GDP by 2021. Extending our budget projections using CBO’s June 2017 baseline combined with recently enacted policy changes and an assumed extension of those and other policies through 2027 suggests interest expense will reach around 3.5% of GDP by that year (Exhibit 6). As US deficit surges, and the debt load explodes higher, there is a silver - if sadly brief - lining: the Treasury continues to borrow at low rates and it should be able to do so for a while even if market rates move higher in our view, thanks to a nearly 6-year average maturity of outstanding debt. As long as the Treasury can borrow at a nominal interest rate below the rate of nominal GDP growth, which we will be the case for several more years, the US can run a small primary deficit while maintaining a roughly stable debt-to-GDP ratio. 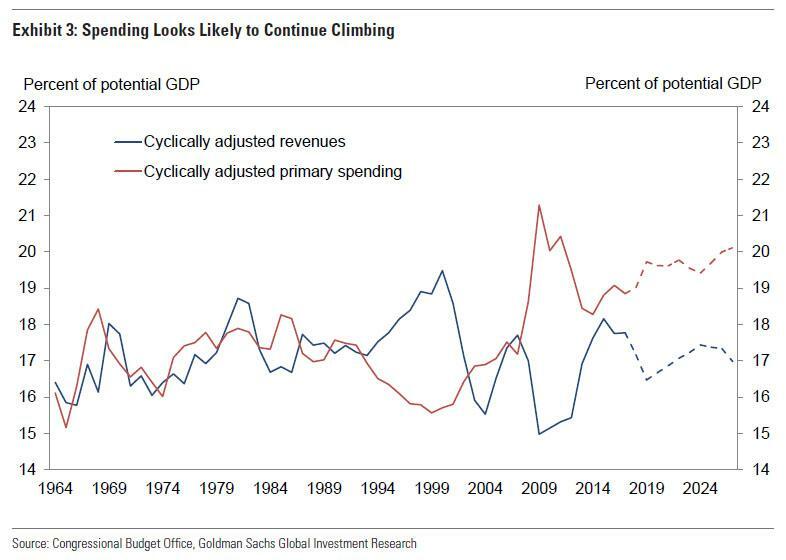 In the long run, however, this divergence eventually becomes unsustainable, as "fiscal policy appears unusually disconnected from the economic cycle." Which brings us back to Goldman's core assessment: the US now finds itself in uncharted territory, because as Jan Hatzius and team explain, "we are unaware of any period in the last several decades when the US cyclically adjusted primary deficit expanded as we expect it to at the same time that the debt load had already been growing, as appears likely now, except for periods in or near recessions." Italy, late 1980s. Throughout the 1980s Italy ran a substantial primary deficit despite a rising debt/GDP ratio. Interest expense grew to 10% by 1990 from 5% a decade earlier. The primary balance returned to surplus in the early 1990s due in part to pressure to do so for admission to the European Monetary System, but the debt/GDP ratio continued to grow for another few years, as a result of substantial interest expense. Japan, mid-1990s.While growth boomed in the 1980s, Japan ran large primary surpluses and the debt level remained stable as a share of GDP. However, after growth stalled in the early 1990s, Japan began to run substantial primary deficits. Unlike the European examples just noted and similar to the potential US experience, interest expense remained relatively low, at around 3% of GDP, owing to Japan’s high domestic saving rate and trade surplus. Nevertheless, the debt/GDP ratio continued to grow substantially over the following two decades, as Japan frequently expanded its primary deficit to address economic downturns and was never able to return to a primary surplus. 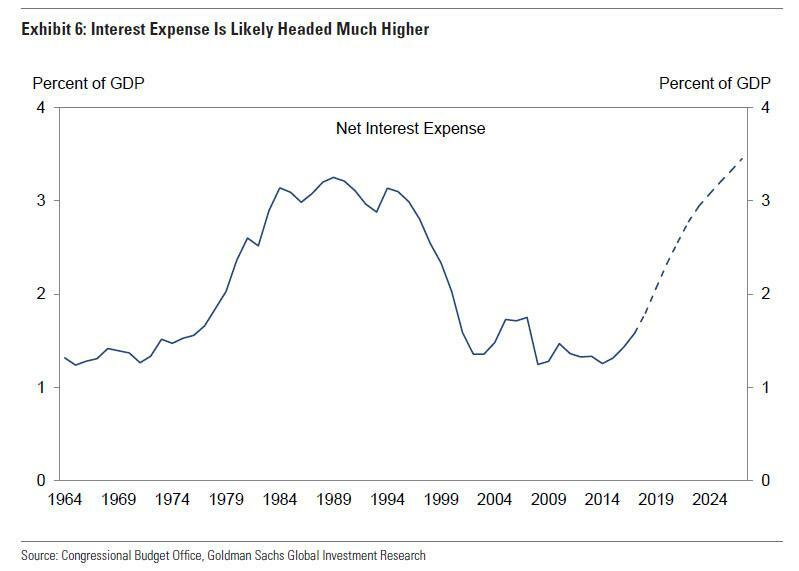 Going back to the topic of surging interest expense, Goldman next warns that "the US also appears to be headed into uncharted territory—at least for US fiscal policy—regarding the relationship between interest expense and the debt level." We recently increased our estimate of the growth effect from fiscal policy in 2018 and 2019, as a result of the recent spending agreement, which added to the stimulus provided by the tax reform legislation enacted in late 2017. Overall, we now expect fiscal policy to boost growth by 0.7pp in 2018 and 0.6pp in 2019 on a Q4/Q4 basis. However, as Exhibit 12 shows, we anticipate that the growth effects will fade later in 2019 and turn slightly negative by 2020. First, a portion of the tax cut over the next couple of years relates to depreciation policies and other timing changes which will have less of an effect on deficits in the future, even if Congress continues to extend them. Likewise, on the spending side, the boost to growth from federal spending that we expect in 2018 and 2019 seems unlikely to be repeated, as the large increase this year more than reversed the cuts imposed under “sequestration” several years ago. While further increases in real discretionary spending are certainly possible, we doubt the annual change would be nearly as large as the boost Congress just agreed to. Second, although congressional leaders and the President have been willing to support deficit expansion to date, it is unlikely in our view that there will be as much political support for further expansions once the effects have been felt, particularly in 2019 when we expect the nominal deficit to climb above the psychologically important $1 trillion level. The next major test could come in late 2019, when Congress would need to vote to raise the spending caps for FY2020 and FY2021. If they do not, real discretionary spending would decline by about 0.5% of GDP and would fall slightly further in 2021. We expect that Congress is likely to hold spending roughly flat, which would result in a neutral fiscal effect but this would nevertheless represent a reduction in stimulus compared with 2018-2019. Third, there is a good chance that control of Congress could change hands after the midterm election this November, as we laid out in a recent US Economics Analyst. Republican polling has improved somewhat over the last several weeks, as measured by the generic ballot and the presidential approval rating. Nevertheless, while we believe Republicans are more likely to maintain control in the Senate given the disproportionate number of Democratic seats up for reelection in Republican-leaning states, the House continues to look quite competitive and the Democrats appear to have a narrow advantage based on public opinion polling. We believe a divided control of Congress ahead of the presidential election would likely lead to a passive narrowing of the budget deficit as some policies are allowed to lapse or are only partially extended. While it is possible under such a scenario that a bipartisan agreement could be reached on infrastructure, for example, even if this occurred we expect it would still lead to less of a fiscal boost than we expect in 2018 and 2019 and would probably involve at least partially offsetting tax increases or spending cuts. What does that mean for the future? 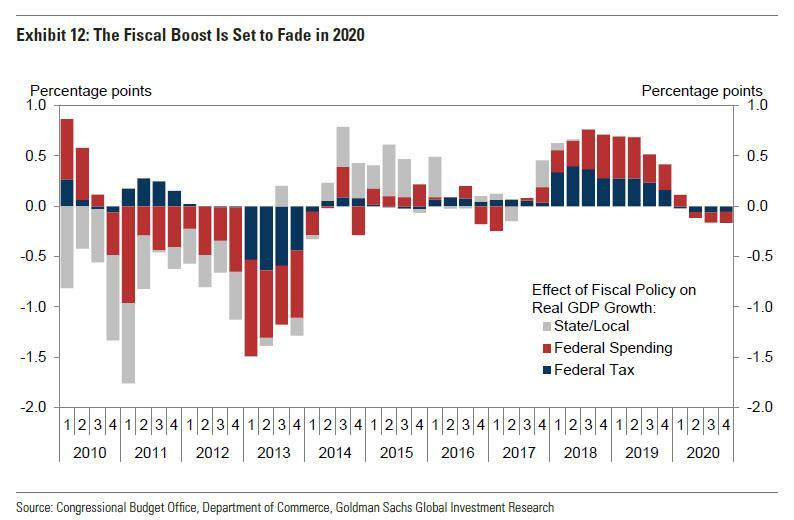 Goldman concludes that as a result of the above, "the probability of meaningful fiscal reform in the next few years appears low. In 2018, congressional Republicans appear likely to skip the annual budget resolution process, without which the budget reconciliation process is unavailable. If so, bipartisan support would be needed for any fiscal legislation, which appears very unlikely in the current political environment in our view... this suggests that the primary deficit is unlikely to widen much further from here absent an economic downturn but that it is unlikely to shrink substantially for the next few years." ... will be gone, and the only thing the US will have to show for it will be well over $1 trillion in annual interest expense (not to mention a stock market in which most companies will have partially LBOed themselves with trillions in future stock buybacks). The irony, of course, is that while one Goldman employee warns that the US is now on collision course with debt sustainability, it was another former Goldman employee - former COO Gary Cohn - who transformed this blueprint for catastrophe into reality. 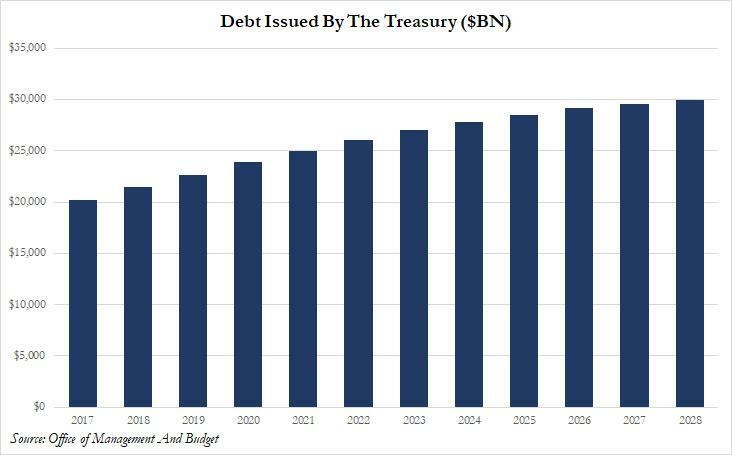 Needless to say, the culmination and outcome of these processes is a fiscal - and sovereign debt - crisis... unless the Fed proceeds to monetize the deficit once again as it did in 2009-2015, sending yields plunging as the next and final episode of QE is unveiled. Which, of course, is precisely what will happen, and is also why Goldman is already starting to load up on all Treasuries it can buy.